I wanted to create a couple of circuits using 555 timers and 4017 decade counters but I seem to have hit a brick wall in trying to obtain any 4017s! Rapid look through equivalent chips with Dean and it looks like I can use a 4028 chip instead. 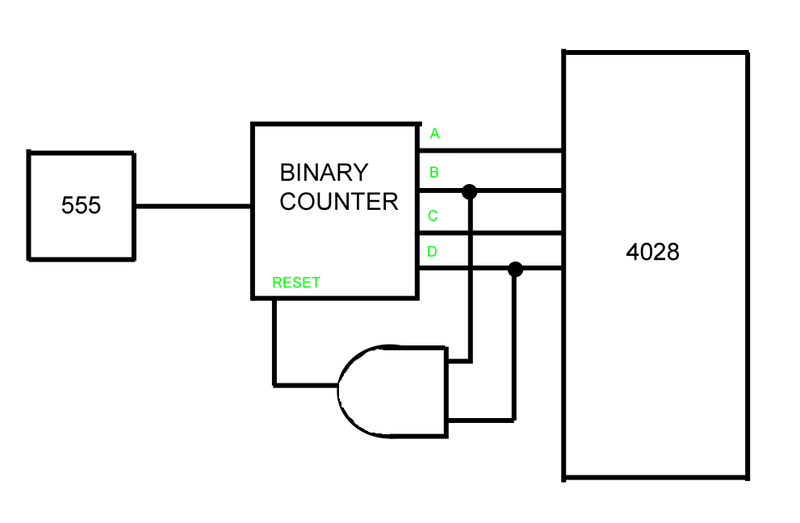 A 4028 is officially known as a BCD (binary coded decimal) to decimal (1 of 10) decoder, this should perform the same function as the decade counter would in my counting circuits. 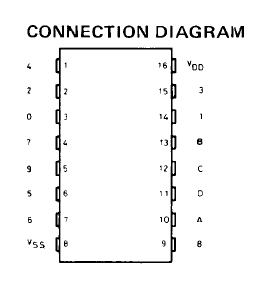 So I’ve calculated my resistor values to give me a good frequency of pulses, I’ve hooked up the 4510 according to the pinout below found in it’s data sheet (more on data sheets here) time to test. I hate it when it’s something really simple that I haven’t spotted, my reset switch was pushed into the board the wrong way round, *smacks head with palm of hand* and this is after Steve showed me how to use a multimeter to see how components should be connected up. An extension of this would be to link up lots of timers together. To do this you connect the carry out (pin 7) to the carry in/enable (pin5) of another timer, this second counter now counts up 10s. By cascading them in this way you can count much larger numbers. Note (07/04/11) There are two types of counting circuit, ripple and synchronous. 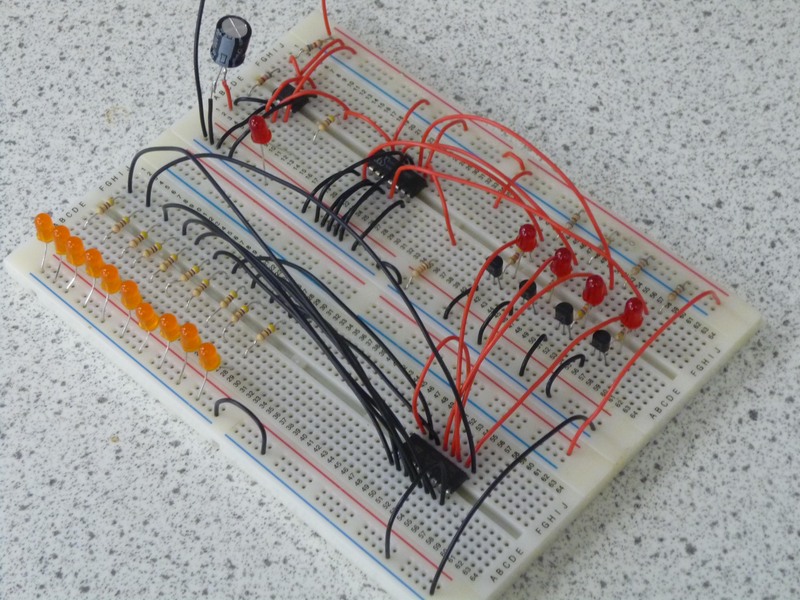 The linked counters above form a synchronous counting circuit, a ripple counter is made up of linked flip flop chips. More on them here along with a more detailed look into ripple and synchronous counters. I get to have a go using the 4028 chip :) All you need to do is to hook up the 4 outputs from the binary counter to the 4 inputs of the 4028, then, carefully reading the pinout (they’re not in order as you can see below!) attach your LED outputs. If you were using a divide by 16 binary counter you’d need to add in an extra step to limit the counter to 0-9. 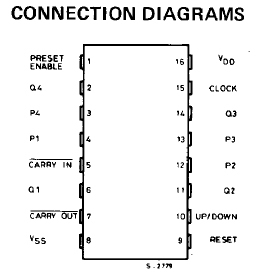 To do this you need to connect an AND gate using outputs B and D as the gates inputs. This would have the effect of triggering the reset every time the counter got to 10 (B and D going high together) keeping it counting from just 0 to 9.